Meditation is an ancient practice of finding the balance between mind, body and soul. Finding ones true self will awaken a deeper sense of awareness. A great way to add calmness and put perspective into everyday life, meditation is a practice you can do from just about anywhere. In our busy world it can be very hard to clear the mind to focus on a deep meditation but there are lots of tools that can be used to make this process easier. It is a powerful tool to be able to meditate even when you are in the busy world, and one that will be incredibly beneficial to your well being. Whether it’s in your serenity room before bed or in the park during your works lunch hour, having a meditation mat is a great way to give you a defined space of solitude in our cluttered world. Meditation mats are an excellent way to create a space that is uniquely yours while meditating just about anywhere. We love their lightweight design making them easily portable so you can take your practice with you wherever you go. Creating a space that is yours will put your mind at ease as well as help to make your meditation even more comfortable. 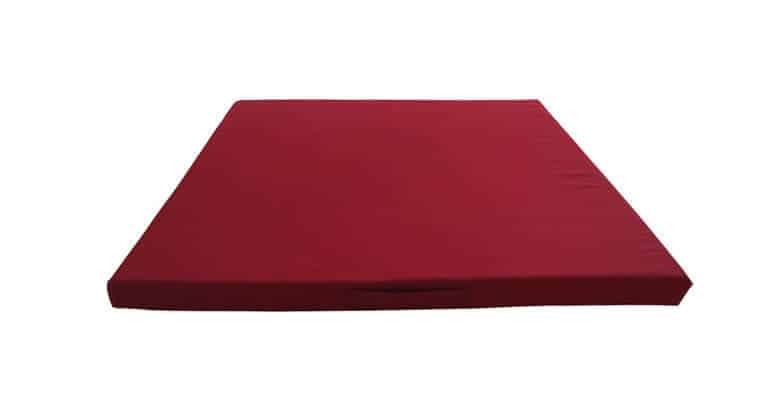 Protecting you from a cold and hard ground, a meditation mat will provide a cushioned surface and can easily be rolled or bunched to provide specific support to targeted areas. Simply fold up your favorite mat and use as a knee cushion or bunch under your bottom to create a pelvic tilt. How important is a mat for meditating? Meditation mats not only protect you from the cold, hard ground but they are lightweight and can be taken with you if you want to meditate in areas other than in your home. They can also be folded to use under the knees in sitting meditation or rolled up to give support to a specific area. Many of them can double up for use as a yoga mat. Meditation mats are often one of the first meditation accessories people buy when they start a regular meditation practice. A meditation mat helps to define your meditation space. These mats vary in thickness but most are very versatile. The thicker ones can be used on their own for sitting meditation and the thinner ones may combine with other meditation accessories such as a meditation cushion. As it functions primarily to give you a comfortable place that is your own, having one that relaxes you will help to get you in the right mind frame. Further, we recommend using a mat that is thick enough to be folded for support and protect you from a hard surface. As a bonus, most of these mats can double as a yoga mat. Meditation mats come in all sizes, shapes, materials, and colors. Your choice will depend on whether you want one that will suit the decor of your meditation space and help to make it a comfortable sanctuary or whether you want one that can be stored easily and carried if necessary. If you are looking for a mat you can easily take with you on your travels, the following yoga mat fits the bill. The Clever Yoga Travel Mat is ultra lightweight, rolls up easily and will fit in a carry-on bag or backpack. It is ideal for traveling and taking on retreats because it is only 1mm thin and weighs less than 2lbs. It is made from non-toxic rubber and is covered with a special waterproof layer as a barrier to keep bacteria out and prevent odors. The soft fabric surface grips hands or feet without being sticky. It can simply be washed in the washing machine. A Mandala is a symbolic circle often used as an instrument for meditation. A mat featuring a mandala is a perfect accessory for a meditation space. The Apoorva's Handmade Fringe Meditation Mat made of cotton has a Peacock inspired mandala pattern and a handmade tassel fringe. It comes with a carry bag so you can take it to the park or the beach. You can even hang it as an inspiring tapestry. Some products today combine traditional elements and infuse them with innovative technology to take your meditation to the next level. The Organically Holistic Acupressure Mat is such a product and it comes with a cervical headrest for proper alignment of shoulders and neck. An eye cover and earplugs are included for deeper focus without any distractions. You are able to lie on a “bed” of needles” (100% non-toxic plastic) to massage all the pressure points on your body. It helps to relieve stress and relax tight muscles. A hand-washable removable cover is included. Children need a mat that is easy to carry, thick enough to offer good support and free from allergens and toxic materials. The Khataland YoFoMat fulfils all of the above requirements and is one of the best mats for kids. It is eco-friendly and only non-allergic and non-toxic materials are used in its construction. It is compact enough to make it easy to store and it comes with a travel case so it’s easy to carry too. The 6mm thickness offers great support and the fact that it is high density and non-skid on both sides provides stability on any type of surface. Touch felt folding lines can be used as coordinates to assist with body alignment. It is also easy to clean using a damp cloth or a mild household cleanser and it should be air dried. The Jumbo Zabuton Meditation Mat is filled with kapok which provides solid support even though it is comfortable. The outer cover of cotton twill has a zipper so it can easily be removed and washed. The best meditation mat for hardwood floors will be one that does not slip and slide around and suits the look of the floor. A mat that looks great on a hardwood floor is a Souvnear Straw and Cotton weave mat because of its design and size. This mat is made by village artisans in India. It has its weft set with ‘darbha’ or ‘kusha’ grass and the warp with cotton thread. It’s sturdiness and the fact that it is six feet long and three feet wide makes it really define a meditation space. It has a natural, handmade feel and doesn’t stick to a sweaty body like a synthetic mat. The Flexifoil workout mat is ideal for use on a carpet or a hardwood floor. This is a high-quality exercise mat that can also be used for meditation. It is 100% non-absorbent and is crafted from non-slip fibers that encourage good balance. It can easily be rolled up and stored and is lightweight enough to be carried anywhere with you. Meditation mats are a quick and compact way to bring meditation with you wherever you go. We love the ability to make these mats unique to your preferred positions. Whether you are in need of a simple kneeling pad or would prefer a comfortable place to lie down, these mats offer you a simple space where you can focus on yourself. Meditation should be a practice you can do anywhere and that’s why we love all the mats on this list. We do have a clear favorite though, the Organically Holistic Acupressure Mat & Cervical Pillow Meditation Mat Set. This meditation pad flies above the rest for its profound restorative powers. Much more than just a simple mat, this holistic haven does wonders for your whole well being. Have you used any of the mats? Let us know what you think in the comments below.